We’re pleased to welcome Albert Lyu as the newest writer for FanGraphs. He impressed us with his submissions to the Community Blog, and so we’ve found a spot for him here on the team. We think you’ll enjoy having his work published here regularly. 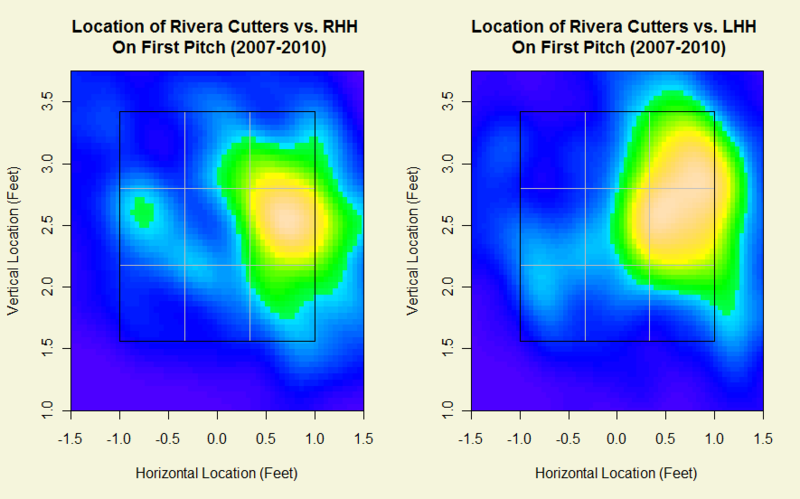 Dave Allen has talked at length about Mariano Rivera’s cutters and how well he locates them, but it’s always interesting to analyze what many consider to be the greatest pitch in the game. I don’t believe that there is any other pitch in the game right now that can be used so exclusively yet so dominantly the way that Rivera uses his cutter. We know that Rivera has pinpoint control and likes to work the outer and inner edges of the strikezone against both right-handed batters and left-handed batters. We also know that Rivera is great at working the count, rarely getting to three balls. 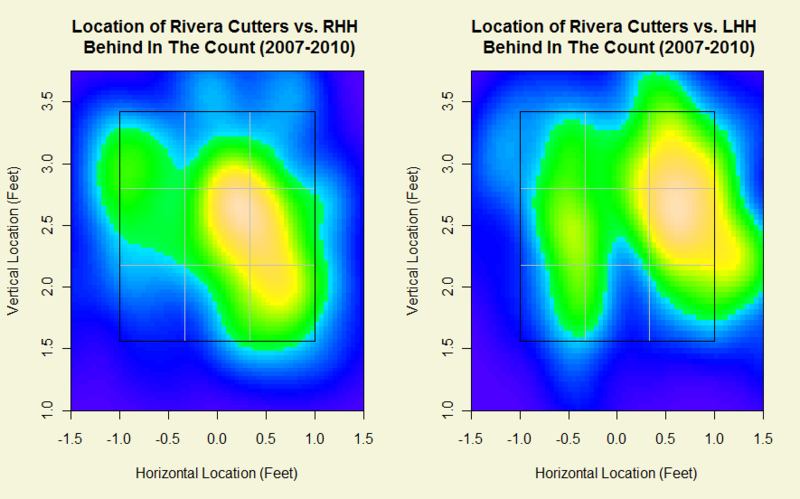 Combining both of these ideas, can we figure out how Rivera works the count based on the locations of his cutters? 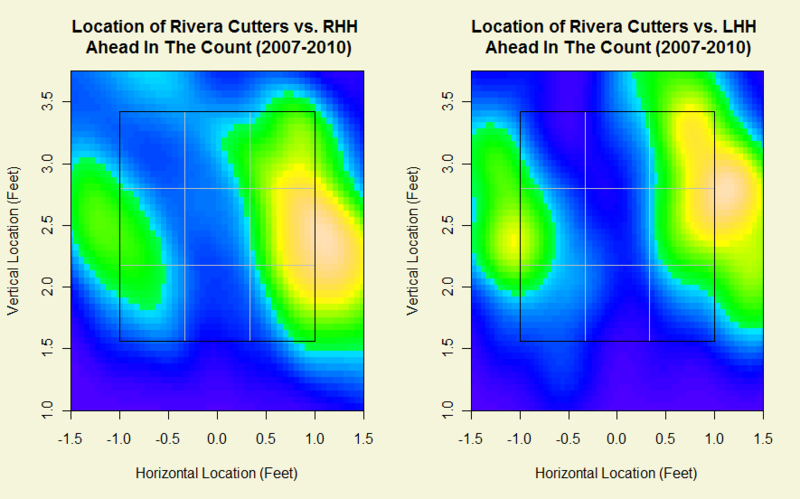 These look similar to the plots when Rivera is ahead in the count except for two significant differences. Against RHH, Rivera goes higher in the zone, especially up and inside in addition to the outside edge. Against LHH, Rivera goes outside much more than he goes inside, very different from the other count situations against LHH where Rivera goes inside more. 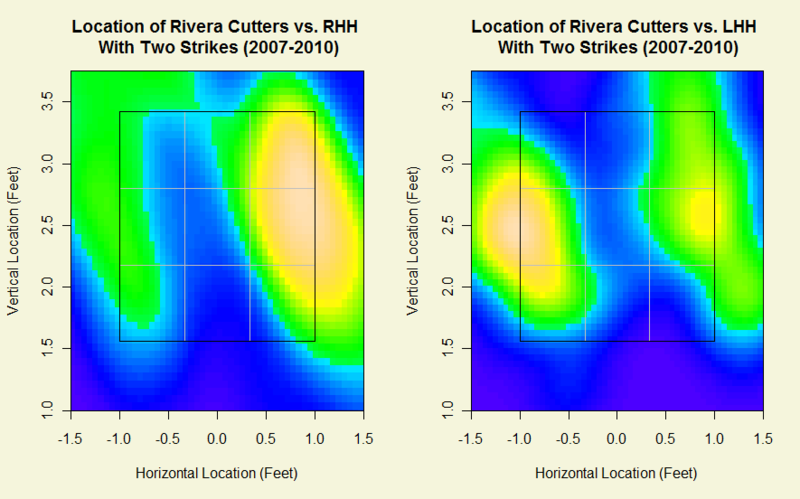 With two strikes, both RHH and LHH should expect the outside cutter most of the time. Just looking at traditional statistics will appropriately show how dominant Rivera has been in his career (2.21 ERA, 8.2 K/9, and 1.00 WHIP in over 1145 IP). However, the plots above tell us how he has achieved such success: by living on the black against both right-handed and left-handed hitters and being able to consistently hit his various spots so that hitters are forced to swing at difficult pitches no matter the count. We hoped you liked reading Rivera’s Cutters Working the Count by Albert Lyu! Crazy-good debut, sir. I salute you.